This true story is about the most charismatic person I have ever met, seen or heard. She was the chairwoman of the Crow nation from 1990 to 2000, Clara Nomee. I first met and heard Chairwoman Nomee speak while attending an all-day meeting in Crow Agency, Montana in 1991 and was so impressed with her awe-inspiring way of speaking from the heart that I’ve never forgotten my encounter. It’s often said that “adversity builds character.” Perhaps that accounts for Chairwoman Nomee’s charisma. Up until 1976, Mrs. Nomee had a problem with alcohol. During that winter both of her parents died within 3 months of each other. Consequently, her drinking increased to the point where she reached a crossroad and asked the Lord to “take my life or change it.” For all of the following years she didn’t have a drink. In 1985 she married Carlton Nomee, who a year later became vice-secretary of the Crow Nation. In 1988, Mrs. Nomee ran for the Office of Tribal Chairperson with only a few supporters. While she did not win that position, she was elected Secretary of the Tribe. As she became more insistent and questioned how the Tribal government operated, she was phased out of her job. Because she had little money, her furniture and car were repossessed and her electricity was turned off. Because she had been unjustly branded a trouble-maker, when she attended church, people walked out; and when she drove down the street, children threw rocks at her car. Her dog was shot, the windows of her home broken, and her life threatened. But Mrs. Nomee prayed every morning for the strength to perservere as she looked out over the Big Horn Mountains from her home. After praying, she cared for her brother, Rayphael, who had been paralyzed from the neck down from an accident 28 years earlier. In addition to praying every morning, she attended every political gathering and eventually became the spokesperson for many. Finally, in May of 1990, with the blessing of many tribal elders, she was elected tribal chairperson of the Crow Nation after a bitter battle between contenders. Although it was not the first elected office Mrs. Nomee had held, it was the first time that the position of Crow Chief or Tribal Chairperson had been held by a woman. Mrs. Nomee wanted to follow in her father’s footsteps, Chief “Henry Pretty-on-Top;” as well as other famous Crow chiefs, such as Chief “Sits-in-the-Middle-of-the-Land,” Chief Plenticoup and Chief Robert Yellowtail (see the photo). As chairwoman, Mrs. Nomee became a role model for Indian women and was an excellent example of how someone turned her life around. The challenges she faced daily in attempting to obtain jobs and much-needed public facilities for her people mandated that she have all of her wits about her all of the time. As Tribal Chairperson, she was in a position to do more good than at any other time in her 55 years. She was instrumental in having a hospital built on the reservation and having the Crow Tribe once again authorized to negotiate its own contracts. She planned to have the old, small hospital renovated into a nursing home and worked hard to develop jobs for the large number of unemployed on the reservation using the Jobs Training Partnership Act. Just as life was hard for Mrs. Nomee, it had been hard on the Crow and other Native Americans as well. A hundred years ago the Crow Reservation had covered 40 million acres. Now it’s down to a mere three million. The Crow served as scouts for the U.S. government over 150 years ago but have not had there loyalty rewarded. Native Americans in the East taught American settlers how to grow corn, tobacco and cotton. Native Americans on the Plains saw their food supply disappear in the mid-1800’s: tens of millions of buffalo were slaughtered by the white man for their tongues and hides. Many millions were killed for “sport” from trains that traveled through the West. As their hunting grounds became settled and taken from them, the way of life of Native Americans was destroyed by forcing them to become dependent on the U.S. government, which shattered their self-esteem. As I mentioned at the beginning of my story, I was very impressed when I heard the Chairwoman speak. In addition to hearing Mrs. Nomee that day, I heard other Crow officials speak at that meeting. Listening to them was a moving experience for me. I had never heard a people so open, honest and considerate of others. Though they had good cause for being very angry at some in my agency, they not once raised their voices. Although my testimony as a technical expert, who had prepared extensively and was ready to make fools of the managers in one of our regional offices and thereby handily win the day for the Crow, the Crow chose not to call on me because it would have certainly meant, at the very least, my getting into big trouble with my agency. Later, when we broke for lunch, the Crow honored me by insisting that I sit at the head of their table. 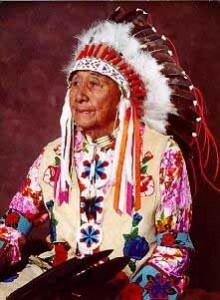 Although the Crow have many problems, as do many Native-American nations, Mrs. Nomee made a difference. Unemployment on the reservation ranged from 60-80%. According to a local authority, 85% of Crow deaths were related to alcohol abuse. Consequently, I continue to donate many Native American charities. My experience with the Crow renewed my faith in humanity. As I flew back to Denver from Billings, I thought of all I had seen and heard. I concluded that the openness and honesty that I witnessed was how God meant people to be and I was fortunate indeed to have seen and heard the Chairwoman, a person of integrity, conviction and love for her people.